Valentines Day is just around the corner. For couples wanting a creative way to celebrate their love this Valentines, the Mountain Rose Inn and Rose Window Studio offers the Celebrating Love, Art & Togetherness Package February 18-20. Couples are invited to come to the beautiful mountains of Southwest VA and enjoy a luxurious stay at the award-winning Mountain Rose Inn. During this weekend away, couples will spend quality time together making a unique stained glass hanging panel for their home. After indulging in the Inn’s delicious 4-course breakfast on Saturday morning, couples will spend Saturday afternoon at the Rose Window Studio in Woolwine practicing the art of working together while constructing a 14” x 16” stained glass hanging panel. 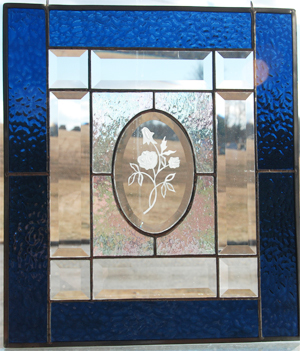 This panel with beveled glass insets including an engraved oval glass centerpiece is a beautiful piece that couples will treasure as artwork that they created together. 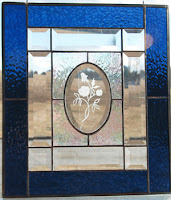 Participants will be taught the copper foil technique during the construction of the panel and will be able to select the color of the accent glass to use in their work. The cost for the weekend is $555 per couple not including tax. Cost includes two nights in a king bedded room at the Mountain Rose Inn, breakfast each morning, sparkling wine and chocolates served in room on the night of choice and all tools and supplies needed to produce the stained glass panel. Make your reservations now for this creative and love-filled weekend away together.